Growing up we are taught not to care what other people say about us with old adages like these. These sayings are great for boosting the confidence of a child, but they do little for boosting your business. Sticks and stones may break your bones, but words... may actually hurt your sales. Customer reviews are not a new dimension of business, however, their importance is growing rapidly in the age of fake news and online researching. This blog post breaks down how critical customer reviews are today, how to best navigate them, and the huge influence they can have on your sales. “Alternative facts,” “fake news,” these are phrases that flooded media waves throughout the most recent election cycle. Look at your Facebook, Twitter, or any social media outlet and you will find your digital world is filled with a deluge of clickbait, questionable stories, phony sources, fudged numbers, and straight up lies. Even more frustrating, it seems that everyone, from your uncle to that friend from high school you haven’t talked to in 10 years, is sharing it. How Does This Affect Your Customers? This climate has led consumers to be wary of most everything they read online, including anything about your company. According to Edelman’s 2017 Trust Barometer, trust in government, business, and media has fallen to record lows across the board. In other words, consumers are less inclined to outright believe the promises brands and marketers make to them. While investing in ads and commercials remains important, you need something to back them up with social proof so they do not fall upon skeptical ears. 85% of internet users say they evaluate a story’s source before even sharing it to their own profile. If people are that careful when it comes to merely forwarding a story, you better believe they are doing their research when it comes to purchasing decisions. The backbone your digital marketing needs is customer reviews, a necessary dimension of trust marketing. The world can be a scary and uncertain place, especially in the age of fake news. Fortunately, despite this, humans have retained some trust in other humans. Authentic customer reviews give organizations and their products a human touch. In fact, 85% of Millennials say reviews influence their purchasing choices, and that’s only one demographic! Furthermore, over 80% of customers look at customer reviews with as much trust as they would a personal recommendation. If this many people are analyzing reviews during their buyer’s journey, it is vital that you learn to use them effectively. You can even look into industry-specific sites that share reviews. The key to generating a higher number of positive reviews is to make the review process as straightforward as possible. Make sure that links to these sites are clearly placed on your business’s website. You can even try following up with customers via email, encouraging them to share their positive experience with your company or product. Their buying experience will still be fresh in their minds at this point, leading to a more accurate review. If left unprompted, consumers are more likely to go out of their way to leave a review only after a negative experience. Finally, seeking feedback can even teach you a thing or two about how to improve your own business. Also, engage with customers on social media, forums, and review sites. Pay extra care to existing customers, encourage them to provide feedback, and you will end up with your own grassroots marketing team that will evangelize loyalty to your brand. When implementing your new customer review strategy, be sure to never produce fake reviews. Fake reviews are the mortal sin of the digital community. Not only are they fake reviews unethical, but customers can usually spot them from a mile away and they can do more damage than an authentic bad review. If you do find a negative review on your hands, do not panic. Negative reviews are not the end of the world. In fact, they are better than no reviews at all. As Peter Muhlmann of AdWeek said, “Responding publicly to those who have had a negative experience with the brand is like winning the marketing lottery in the age of distrust.” It gives you the chance to engage with your customers in a personal and honest way and if done well enough, you may even resolve the problem and regain the consumer’s loyalty. Consumer’s loving your brand is great and all, but how does it relate back to sales? The short answer is - the more customers you satisfy, the more that will want to buy your product - but this is an oversimplified explanation of the litany of ways that customer reviews influence your business’s digital presence and in turn, sales. Reviews not only show consumers that your brand is trustworthy, they also have the potential to exponentially improve your business’s SEO. Search engines may be powered by coding and algorithms, but they have found a way to incorporate a human aspect as well. Customer reviews (especially positive ones on Google Pages) are social proof that your business is legitimate and credible. The result is a higher search engine rank. Customer reviews not only help your SEO blossom, but they also affect click-through rates. Simply having a review or product rating in your page’s meta description can improve click-through rates as much as 20% by lowering friction and building trust before a visitor even gets on the page.! 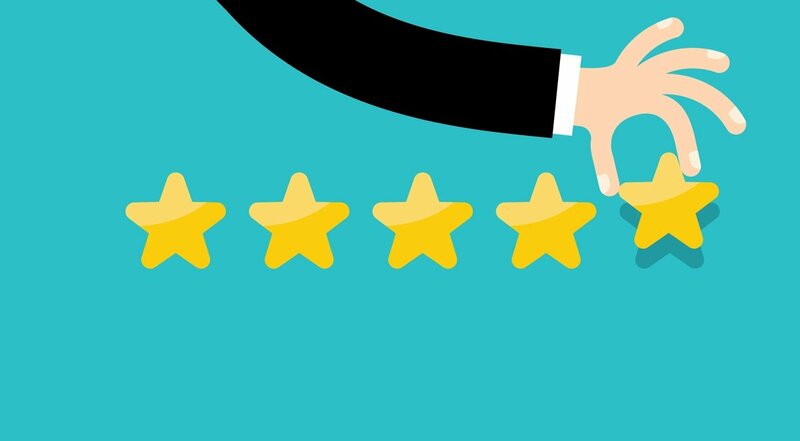 Overall, customer reviews are a vital piece in the process of convincing prospects that your product or service is better than the competition and truly offers the value that you are selling. For buyers, it is a vote of confidence that the purchase decision they’re making will be a good one, and this confidence makes them more willing to sign on the dotted line. Ignoring what others think may be good advice for your personal life, but when it comes to your business, it needs to be tackled head-on. Customer reviews have enormous potential to turn a passive shopper into a lifelong, loyal buyer. In a time when consumers are skeptical of everything, customer reviews are held to a higher standard. We live in a world where John Doe’s opinion on a product is just as relevant as that of an industry expert. These tips can help you proactively face the challenge of believability. Invest in trust marketing and in turn, invest in the success of your business. Looking for even more tips to help you improve sales? Check out our top tips to learn more.